After all the writing last week, some nice photos to mix it up today. If anyone discusses over whether to get an iPhone or not, my default answer is for the camera alone, an iPhone every time (the Panaroma feature works automagically, no extra apps/gimmicks required. Portrane last week on a beautiful day. Fond memories of my first forays bouldering outdoors here! Naomi, of ElementsYoga (and provider of the climbing yoga classes at Awesome Walls and near Gravity) making the most of a nice platform up the path. Main bouldering area in Glendalough all below and to the left. 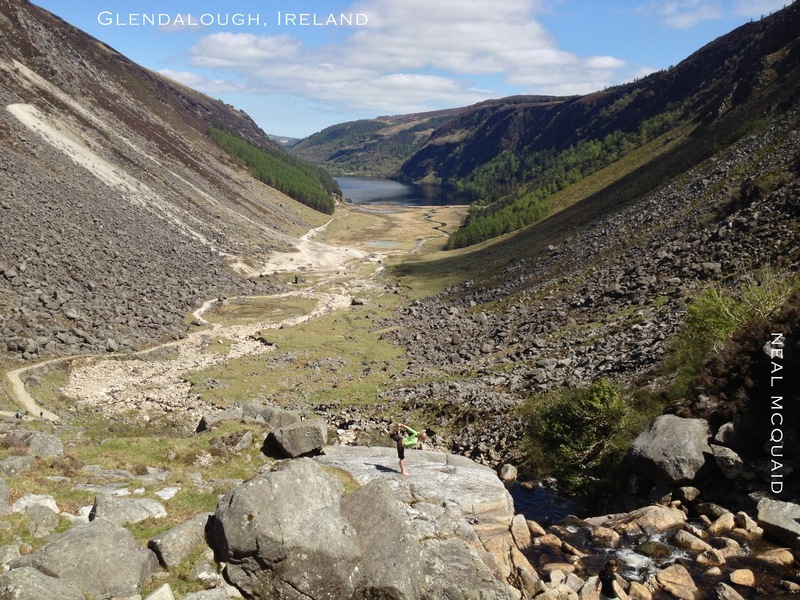 First time I'd ever seen this happening in Glendalough! Theo walking a slackline across the river yesterday. Super inspiring to watch! ....and thinking about the return journey. Which turned out to be much harder as the line was downhill so requires more preparation. Next time Theo!!!! !